What the recent investment by BBVA might mean for the Berlin-based fintech startup. For anyone not yet familiar with the company: solarisBank is a Berlin-based, 150-person tech company with a full banking license, serving 60 corporate customers. It all started with the concept of building solarisBank as the first banking platform native to the digital economy – a platform that would enable any company to offer financial services. A few years ago, fintech startups used to working in the agile way, were struggling with lengthy and inefficient setup processes with traditional banks. “Traditional banks have been a drag on the digital economy because they were unable to keep up with the financial needs of companies like Zalando. We’re fixing this problem by creating Banking as a Platform” the quote from Marko Wenthin, Board Member of solarisBank, explains it in plain words. Want to learn more about the way solarisBank does business? 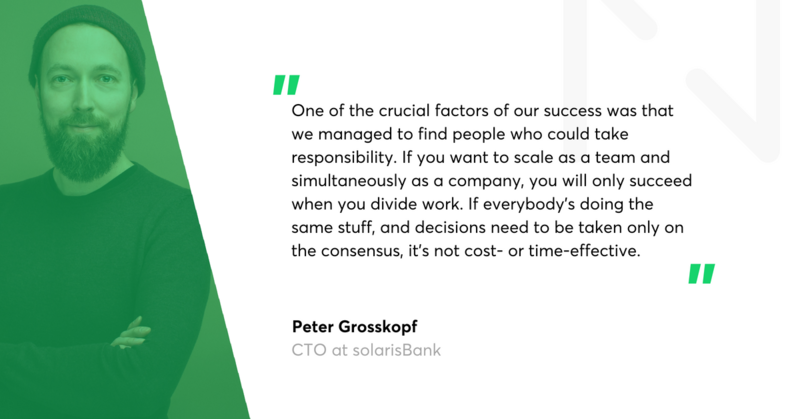 Read Netguru’s interview with Peter Grosskopf, CTO of solarisBank, former CTO of HitFox Group and the software engineering company, Zweitag. Tomasz Grynkiewicz, Netguru: You have been able to convince BBVA, one of the biggest banks in Europe, to bet their money on solarisBank. What does this investment mean to your company? It is a confirmation that we did an incredible job within the last two years since our launch to build something valuable. BBVA is one of the world’s most innovative banking groups, which sees a lot of potential in the fintech space. We are happy to be one of the names, amongst Atom Bank and others, on the BBVA’s investment portfolio. What does it mean to you as CTO of solarisBank? Before BBVA’s investment, I was involved in the technical due diligence, and we had a couple of touch points with the BBVA’s innovation lab as well as people from their blockchain department. I'm expecting that we will have cool and innovative projects together. SolarisBank is active in Europe, and BBVA is already a global company. We could imagine that we can leverage ourselves through them to become more global and also to have some joint projects with a global reach. Fingers crossed. Correct me if I'm wrong, but before joining solarisBank, you had had no previous experience in financial industry whatsoever. None at all. Back at the university, I had always thought that finance was the worst and most boring thing in life, so I would have never imagined having anything to do with the financial industry. Today, I know that it all gave me a headstart in the industry. I was not biased because of my background, and I was able to look at the fintech space and come up with new ideas, seeing what technology could enable there and how we could use digitisation to change the way banks operate. Have the founders raised any objections to hiring a CTO without any financial background? On the contrary, they were pushing for it. This was an opportunity to bring two worlds together: banking and a startup approach to technology. There are many different interpretations of the role a CTO plays at a company. A CTO could be a person who has the broadest knowledge of technology in the company or a manager who enables the tech part of the company to scale, or anywhere in between. Where is Peter Grosskopf located on that spectrum? I see myself in the middle. I have a strong technical understanding, but I don’t claim that I am the most knowledgeable tech person in the world. If this was the case, then I would always be the bottleneck. 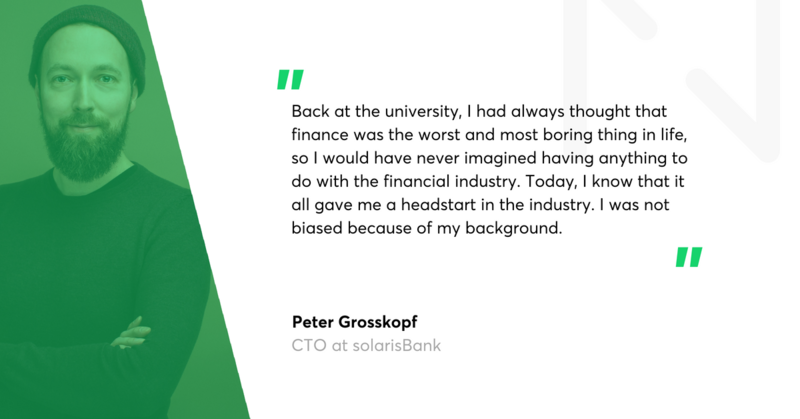 My role at solarisBank is to be the driver of innovation. I'm very curious about new technologies, as well as new use cases of the existing technology. Nowadays, I am focusing on research topics. One of my projects of last year was to build a data platform that would be compliant with regulation and data privacy laws that we need to follow as a bank. My role was to have the initial idea, pitch it to the management, have the first people build a prototype, and then find people to take the project over as a permanent team. Now, as the project is running on its own, I'm involved only as a person providing the vision and direction. SolarisBank started from scratch and built a real banking platform. 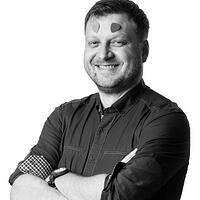 What are the lessons you’ve learnt over these two years as a CTO? How did you manage to scale the tech team and the product so quickly? My job at solarisBank, when we speak of day-to-day operations, changes every two weeks. It’s about having an idea, bring it up, find specialists for that topic, hand it over, then launch it. Only then we were, and still are, able to scale. Why is it so necessary for growth? When we started, we needed to build a cloud-like deployment and delivery environment on our own. Of course, I could have sat down and built it myself, but hiring an expert – someone who’ve done it a couple of times – made much more sense. I believe that this way of doing things is essential for fast growth. The expert can take the ownership and drive the topic further, and I can focus on different things that need to be built as well. It is like a process of mitosis - a single cell splits into two cells, then divides into four cells and so on. Following that path, we were able to grow to a team of 30+ developers within the first year. And I think this has been an impressive growth, because in the same year, we applied for and received the banking licence and made our first revenue. After the first year we had our Head of Engineering Ingmar Krusch start as well, who became responsible for scaling the day to day engineering organization and I started to take care of innovation and research topics. It all happened amazingly fast. I would assume that building the infrastructure for solarisBank banking-as-a-platform would rather be a long-term game for patient investors. How did you manage to raise money in such short time? It was possible because we built everything in a way that enabled us to generate revenues early on. We started with a relatively simple architecture. 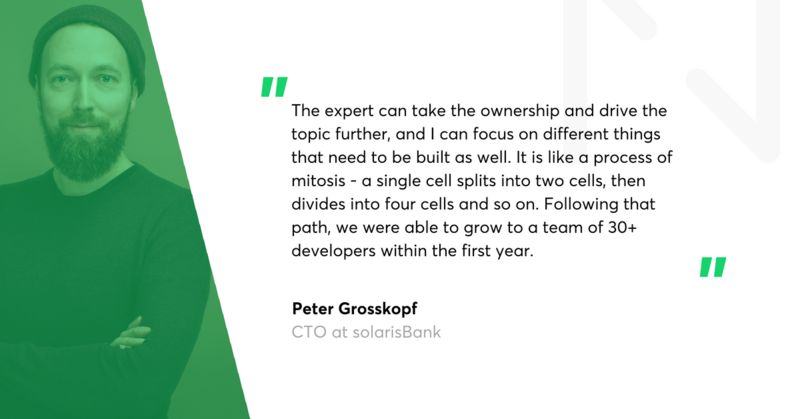 And from there, we began to build more sophisticated projects, turning solarisBank into a more service-oriented infrastructure. Today, we have 12 teams working as the tech team – they develop different products and services. Each of these teams was created with that splitting-the-cell method. What qualities were you looking for while recruiting? One of the crucial factors of our success was that we managed to find people who could take responsibility. If you want to scale as a team and simultaneously as a company, you will only succeed when you divide work. If everybody's doing the same stuff, and decisions need to be taken only on the consensus, it's not cost- or time-effective. I believe our companies share similar values. And this is what I appreciate in working with Netguru: that you take the ownership, you're experienced, and that we can rely on you. I know from my experience that Netguru is used to working in remote settings, where your clients trust that you will try to build things in the way they like to have it, even when you're not present in their offices. I’m happy to say that so far it worked tremendously well for solarisBank. Thank you for your kind words. Coming back to solarisBank: the competition on the market is fierce. What features or values helped solarisBank to stand out from the fintech crowd? I like to compare our platform to be Amazon’s AWS for banking. If you browse the web or use an app, it’s very likely they are run on AWS data centres. The real magic happens in the background. You don't know where the servers are located, and you don't care where the web comes from. The idea behind solarisBank is that we want to push banking back to the infrastructure level, where we provide the services that you can integrate with to build your bank with our APIs. We have a full banking licence received from the European Central Bank. Therefore, we can grant various different companies a license umbrella, making solarisBank that infrastructure provider. What do this umbrella and your banking platform mean in practice? It means that you can build your own “bank” on top of our platform hire us to do the background job, and, in the meantime, you can focus on your core business. We split all the services that the bank can do onto different kinds of technical APIs. We call them bricks. Exactly. Our partners can pick the bricks they require and assemble custom solutions that fit their business needs. It's like playing with Lego bricks so that you can have different functionalities in different combinations. So we provide APIs for opening bank accounts, including the KYC (Know Your Customer) process of authentication, we provide APIs for wiring money from A to B, scoring, giving loans, etc. Moreover, we offer banking bricks for services for different legal entities such as natural persons or SME’s. Last year, we kicked-off a process to evaluate solarisBank’s position in the cryptocurrency and blockchain environment. We are open to working with crypto-startups, and we started to build infrastructure in that environment. We feel that this technology might also be, at some point, disrupting the banking business model. Therefore it's important to start now and see how this will evolve. What products, technologies or ideas inspire you in the further development of solarisBank? I got the cryptocurrency and blockchain bug somewhere in 2016. It is quite an intensive relation; I read about those topics for many hours each week. I am still not bored. This reminds me of the time back in 2005 when I discovered Ruby on Rails. I felt so inspired that I got caught in a kind of a black hole and fell into it to explore an utterly new galaxy. Ten years later, it happened to me again with cryptocurrencies and blockchain. Peter Grosskopf got a cryptocurrency (not necessarily the Bitcoin) and blockchain bug in 2016. The German fintech community seems to be booming. A lot of great companies fixing the banking industry come from Germany, such as N26, Clark, SMACC, Friendsurance, Finiata, Kontist or Penta. How would you rate the German banking industry’s approach to innovation? I don’t think about traditional banking a lot. However, it seems to me that many German banks are relatively "uninnovative" in comparison with their counterparts in other regions. For instance, I have touch points with banks from Norway. And I have the feeling that in Norway, the market for fintech is tiny because the functionalities that are provided by traditional banks are quite good. So there is not much space left for innovation for the newcomers? The better banks are, the less fintech you need. Fintech, in general, started to make room for itself by unbundling the banking experience, taking functionalities from banks and making it better. Today, we have a different market situation in which many fintech companies cannot provide any service without the bank. On the other hand, banks realised that they are too slow to innovate and, therefore, some forms of collaboration with fintech might be essential. What is solarisBank’s place in the financial ecosystem of the future then? We believe that we can, step by step, introduce more innovative financial products. We have already raised the bar for the banking industry, and this is also our way forward to keep changing everything related to the banking.